There are 11 eighth-graders going to the high school next fall, leaving the Bulldogs with just two returning players for next season. Lildrico Thompkins gets between coverage and lays up two of his nine points for the Bulldogs. Jamari Redding hauls in a rebound and also led the Bulldogs with 16 points, as DeSoto County beat Hill-Gustat, 39-32. Redding scored 10 of the team’s 13 second-period points. The Bulldogs’s Marquel Summers goes up for a bucket in the third period. Summers scored the first six points of the second half to give the Bulldogs a 10-point lead over Hill-Gustat. The only blemish on a perfect season for the boys basketball team from DeSoto County Middle School was a 10-point loss to Hill-Gustat earlier this season. The Bulldogs came back to beat the Eagles Tuesday night, 39-32, to run their record to 7-1 and take over sole possession of first place in the Heartland Conference. The Bulldogs trailed by a point at the end of the first period, but outscored the Eagles 13-8 to take a 22-18 lead at the break. Jamari Redding scored 10 of DeSoto’s 13 points in the second period. Redding had 12 in the first half and was the game’s leading scorer with 16 points. Lildrico Thompkins had nine and Marquel Summers added seven more. Summers scored the first six points of the second half to give the Bulldogs a 28-18 lead. DeSoto outscored Hill-Gustat 12-5 to take an 11-point lead into the final six minutes of play. The Bulldog lead grew to as many as 16 points in the third period, 34-18, but it went away as fast as a July snowman. The Eagles cut the lead to six points with a productive early fourth period. “Our guys got complacent and lazy thinking that the game was over and we stopped playing good defense. 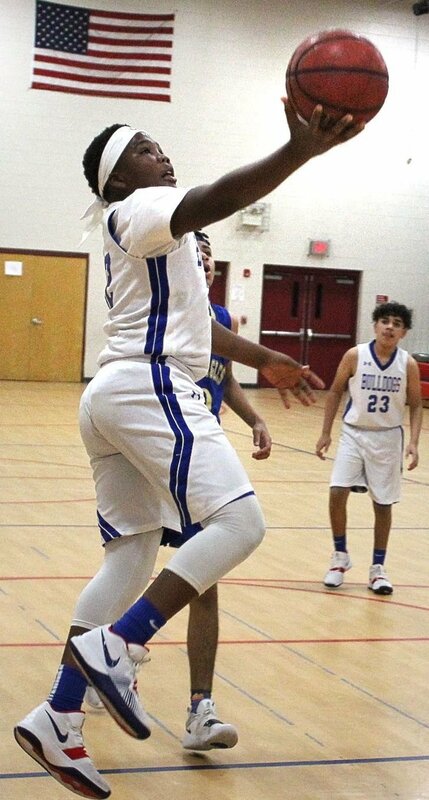 They’re kids and they’ve got to learn that the game isn’t over until there’s nothing but zeros on the scoreboard,” said Bulldog coach Jamar Jones. The Bulldogs got back on track and stopped the skid to hang on to their 39-32 win. It was senior night for the Bulldogs, as their eighth-graders were introduced before the game. Eleven of the 13 players on the team are going to be in the high school next year, so the team will be extremely young at the middle school. “Rebuilding isn’t the word for it. It will be a whole new makeover for us next year. I’m not thinking about that now, I’m just enjoying the win tonight and how we’ve gotten better over the season. I’m very proud of my boys,” said Jones.